I hope they do more after these. There's a ton of Capcom characters I'd love figures of starting with Chris, Dante, Chun Li, and Morrigan. A part of me would like to see these packs lead to Hasbro just doing a Capcom series of figures on its own (no Marvel pack-ins). Just something that would be nice, it would be a serious longshot but I'd get some Power Stone figures if they made them. That's be all kinds of awesome. Guess it'd depend on how well the game packs sell and how good of a working relationship Marvel, Hasbro and, Capcom have. Woulda kinda been nice to get a new mark 1 but.....its hasbro. That it would. I'm looking forward to that Ryu though. I was fine with my Jazwares figure but the one Hasbro's doing blows it out of the water. Same here. Maybe it would would add a punch back to the line. Sorry to sidetrack a bit the post, but seeing all these new ML releases got me wondering... Are they killing the 3.75" line? No. But they are on the back burner for right now, with a full resurgence later. Right now they're staying alive through Movie two packs and exclusives mostly video game focused releases. Waiting for some of the backlogs to clear out, and then a full retail push to start again once demand is there and retailers are willing to support it again. Some backlog spikes and other issues caused some mild problems. The sales strength is still there and should be working forward in later years once the market is strong enough to hold again. Right now the stronger emphasis is on 6 inch figures though and to feed that demand, but once that demand is satiated on movie stuff, movie 4 inch will make a stronger return to fill the demand in a new way. Same as what's going on with Star Wars too really. Stronger push on 6'' for now with scaling back 4'', with 4'' going to make a return later. This way it creates a sales means to multi-tap the market and balance it to keep material from becoming too stale too fast and lacking material to sell later. Hasn't helped that some fan areas like to jump to conclusions, name call, and throw hissy fits about it though. Which has made it rather a complicated area to even want to bother to deal with. 1:18th scale Marvel will be making a return later as it's taking a breather for right now, but it's staying relatively present through the exclusives and two packs for the time being. Though the cinematic/comic ones hit a snag with Enchantress/Skurge clogging shelves more than expected. So we may not see an Infinity War 2 pack set until Avengers 4 or Captain Marvel. But something is probably being planned for later to further celebrate the sales boom that was Ironman 2 and Avengers 1 that was 1:18th scale. 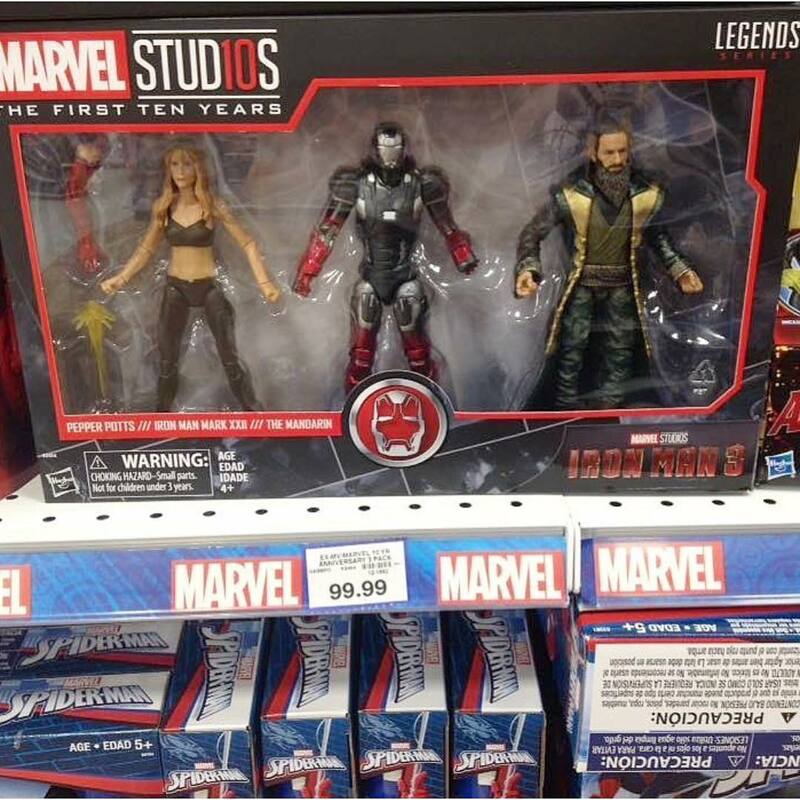 Likely some mixed two packs like Marvel Legends is getting. Like the Iron Monger cockpit version, and a MK III re-release, alongside some other things. There are some other cinematic 2 packs that'll likely find new ways to get back to market too. Same as they may find a way to re-use some cinematic stuff for comic related material too, like the Destroyer armor getting re-released. There's one thing you can always count on hasbro about. They'll never waste an opportunity to sell old things to you again. So a MK V suitcase armor ironman and the Whiplash drone is likely to get a re-release as a set somehow too. Same to some others from across the years. Especially sets that were as strong sellers as Hulk vs Thor was, or how much a Wasp/Ant-man pack might sell. Or eventually some way to re-release Black Panther's figure from the Sharon Carter two pack. And some others they can manage to do as well as some new stuff. It's only a matter of when. So be patient, more is coming. But it's going to take time. If the video game packs sell well, and they likely will with the upcoming choices, there's a lot more that is wanted to come forward as relationships between companies become more fruitful. The video game packs will be heavily 1:18th scale. Last I heard, much of the video game licensing areas are going to be 1:18th with some random 6'' thrown in too. So this likely means both on overwatch too. Last edited by Snowflakian; 06-11-2018 at 05:02 PM..
Any idea what store will carry this in the states? Last edited by Nitelife; 06-21-2018 at 05:25 AM..
Haven't heard anything official, but I don't see why the normal outlets wouldn't carry it. GameStop, FYE, Target, for physical retail, and then places like Dorkside and BBTS for online sales. That 3 pack is my biggest want from the 10 years packs. I'm excited for all three, but I wish we got whiplash instead of Hot Rod Armor. It's supposed to just be Iron Man 3 but I'll agree that almost anyone would've been better than a War Machine repaint. If I was picking I'd actually go with Happy Hogan, he's been in enough movies and there's a kinda meta celebration since he kicked off the MCU. I think the only reason not-Mandarin is in the set is because Hasbro made the sculpt and showed it off back before the movie was even out but it was cancelled at the time, it makes sense that they'd jump at the opportunity to cash in on such a unique sculpt. Yay! I so glad we are getting this still. I had pre-ordered it on Toys R Us but they canceled of course but glad I’ll be able to get this when it’s available to order. My guess is BBTS will probably have it for order when they are allowed to. I’m just glad some of these sets won’t be coming out all at once. Last edited by Meta; 06-21-2018 at 02:22 PM.. There are so many better figures that could have been made across this entire anniversary line that would be better than that Pepper and repaint. I mean, good on all ya who are excited for it, but c'mon, we haven't gotten an AoU or CW Hawkeye! I mean, good on all ya who are excited for it, but c'mon, we haven't gotten an AoU or CW Hawkeye! It may sound harsh to those that want the IM3 set but I would replace it with an AoU final battle pack: Ultron, Quicksilver, and Hawkeye. I guess that's too many new figures for Hasbro to swing, eh. Has there been a rescue figure yet? Wasn't Rescue used as a Marvel Unlimited subscription exclusive, or was that a 3.75" version? Pretty sure it was a 6" Legends figure. It was just them finally releasing the figure which was shown back when IM3 was set to have more figures (including not-Mandarin). They could be nice and make her available again either as an individual figure or in a multipack, every other Unlimited Plus exclusive figure was just a repaint of an otherwise available figure. She was originally supposed to be released in 2013, but then got put on display at SDCC 2016 for the Unlimited Plus subscription exclusive. It's funny, I was literally looking this up the other day and asked the same question. Out of all the armors, Rescue and Ironheart could use a 6 inch release in pack. I mean we've already seen what the Spider-Man line can really do when given free reign. Iron Man is just another that would deserve a wave pack where the BAF was something like Crimson Dynamo or IM2 Whiplash, or something cool from the archives. Last edited by Dormamu; 06-22-2018 at 06:46 PM..
Wooooow.... way to put Langley on the map! Are we seriously the first place to get this set on shelves? Amazing! Picked mine up yesterday by fluke... I just kinda figured it was out in the States by now and I just haven't been paying attention!